Using lasers to treat your ailments is no longer just for Hollywood sci-fi movies, its here today and revolutionizing the way we treat pain. Laser therapy is the use of specific wavelengths of light energy to create therapeutic effects in the body. These effects include improved healing time, pain reduction, increased circulation and decreased swelling. Laser therapy has been widely utilized in Europe by physicians as far back as the 1970’s. After FDA clearance in 2002, the use of Laser Therapy has continued to increase in the United States and is used extensively today. Laser Therapy has come a long way from its beginnings, when the therapeutic effects obtained from the treatment were not fully understood. It was considered a “voo-doo” treatment that worked, but the how was not understood. With advancements in modern technology, we now understand the mechanism of action and have been able to develop better, more effective lasers. Today there are thousands of published studies demonstrating the clinical effectiveness of Laser Therapy. The treatment is backed by science, and best of all, there is no surgery, drugs, or pain involved. The mechanism by which the treatment works is complex, and involves interactions on a cellular level. The laser energy is absorbed by key cellular enzymes, increasing their activity and boosting normal metabolic activity. The result is increased production of cellular energy (ATP), increased tissue oxygenation, and increased blood flow. These effects lead to faster healing, decreased pain, and improved function. For an even deeper explanation into the metabolic effects of laser therapy, we invite you to take a look at the video link listed at the end of this article. You may have had laser therapy in the past without experiencing great results. However, the new class IV K-Laser is not the same as any laser treatment you have had before. 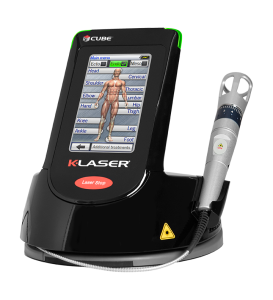 K-Laser is leading the way in pain management, tissue repair, safe treatments, and faster treatment times. The K-Laser is on the cutting edge of therapeutic lasers, and the only laser to use 4 different wavelengths of light, each specifically targeted to a different aspect of healing. It is also the most powerful laser, delivering more energy in shorter treatment times. What does all this mean for you? A faster recovery without the harmful side effects of drugs and surgery, and getting back to doing what you love sooner. Greenville Foot and Ankle Specialists are excited to be the only practice in RI offering this state of the art treatment modality. Make an appointment today to find out if this option is right for you.